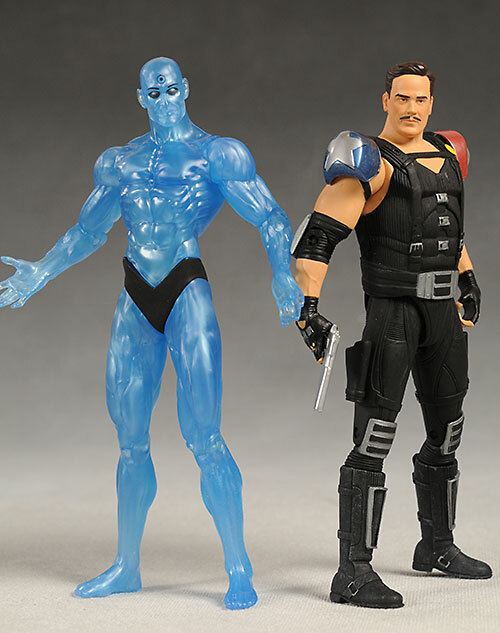 The movie is already a distant memory, but I wanted to finish my look at the action figures with a quick peek at two of the variants - translucent Dr. Manhattan, and young head Comedian. These two were/are available as Diamond exclusives, so just about any LCS or online retailer should have them. But as is often the case with an 'exclusive variant', the price tag is a little higher. You can expect to pay $18 - $20 each for these two, and Manhattan is generally the harder to find of the two. As you'll see in the review, there's a reason for that. 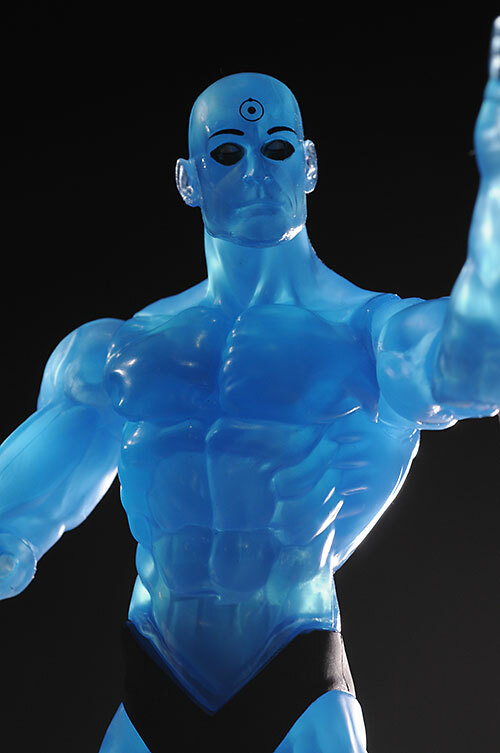 I suspect that this current crop of Watchmen product will all we get, at least movie based. Hot Toys has talked about doing some sixth scale figures, but I have no doubt that they'll take into consideration the worldwide box office on the film before final commitment - I doubt the bad tacit from the Spirit has left them yet. I really do hope we get a Rorschach or Comedian from them, as they are perfect characters for their exceptional talents. These two come in the same easy to store, easy to open, attractive boxes with hanger cards as the rest of the series. 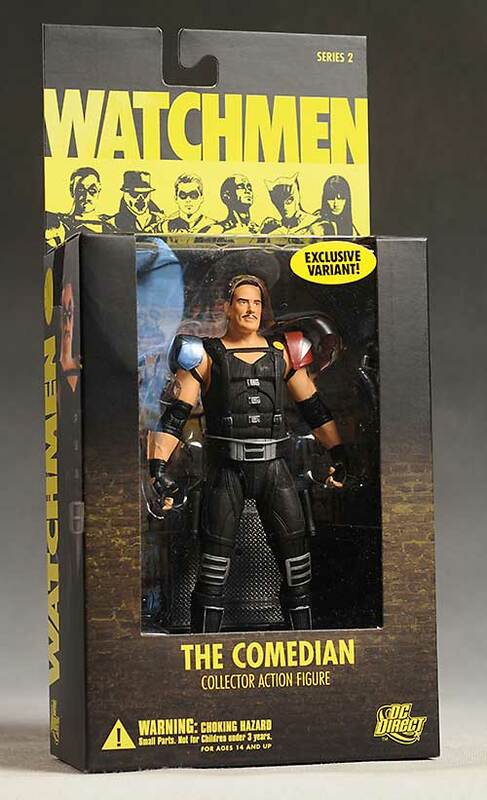 The Comedian's package is collector friendly - everything can come in and out without permanent damage. Dr. Manhattan's is not, since the two stands (girder and clear) are heat sealed to the interior tray. 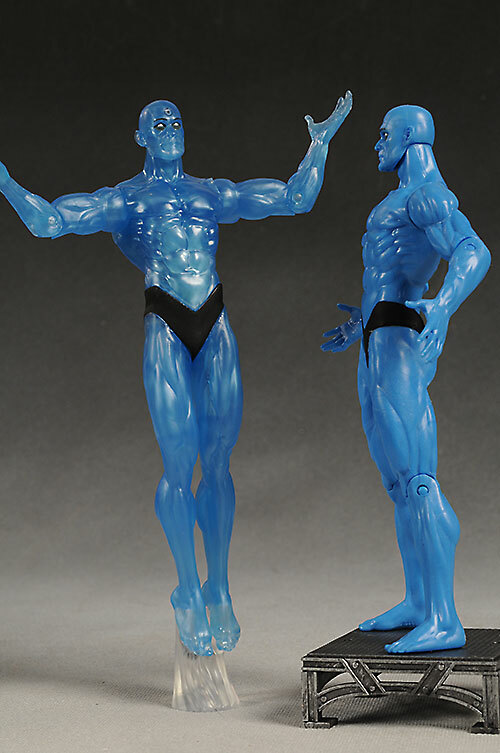 The basic sculpt on Dr. Manhattan is exactly the same as the regular version. It looks great once again, and is one of my favorite sculpts in the entire line. While the articulation limits the posing, at least the main sculpted pose looks great. Swap in the 'floating' legs, and you have an excellent representation of the on screen character. With the Comedian...not so much. Just like the regular release, the work from the neck down is quite impressive. Lots of detail on the costume, and I think the proportions are pretty realistic. Uh, but who the Hell is that portrait supposed to be? It sure isn't the character from the movie, young or old. The portrait wasn't great with the regular version either, but the scarring and mask helped hide some of the deficiencies in the likeness. Here, there's no such luck. 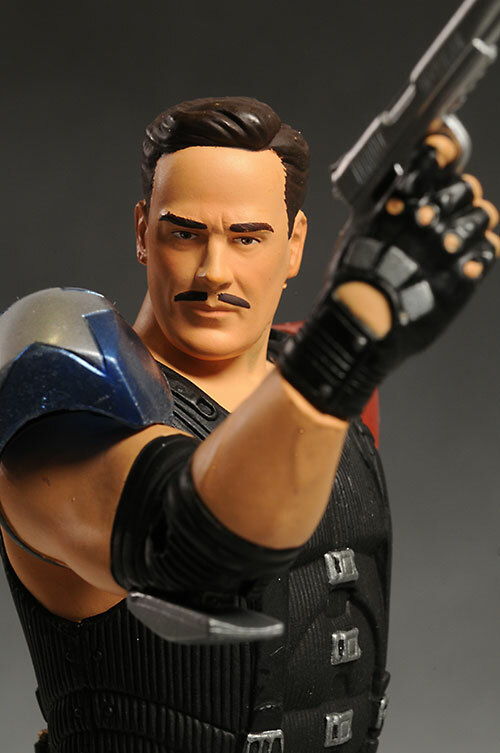 His hands are sculpted to hold the guns, and they work well. Both figures stand fine on their own, although they do come with stands. Both figures are about 6 3/4" tall, and fit in with the rest of their comrades, if not necessarily every DC Direct comic series. The one aspect that DC Direct seemed to get right across the entire series of figures was the paint ops. The quality is quite high on all the figures I've seen, and these two are no exception. Like his previous version, the Comedian's best paint work is on his uniform. There's lots of small details including the silver buckles, smiley face button, and various rivets. 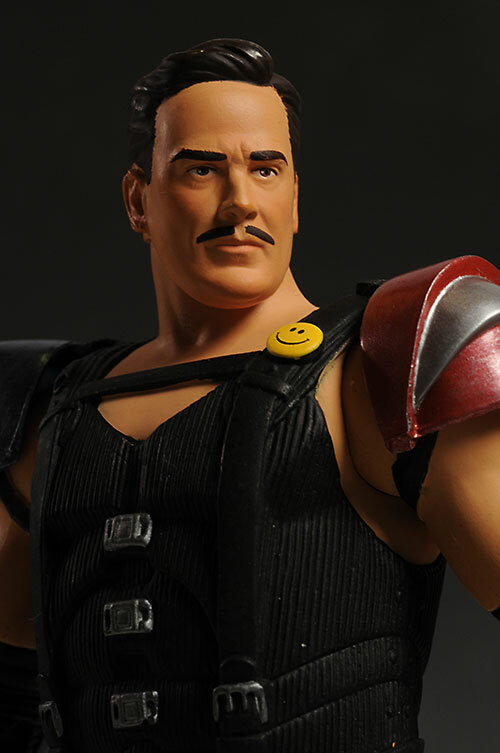 The mustache, eyes and eyebrows are fairly clean considering the scale, and the hairline is sharp and even. Dr. Manhattan gets a boost up in this category over his previous incarnation. 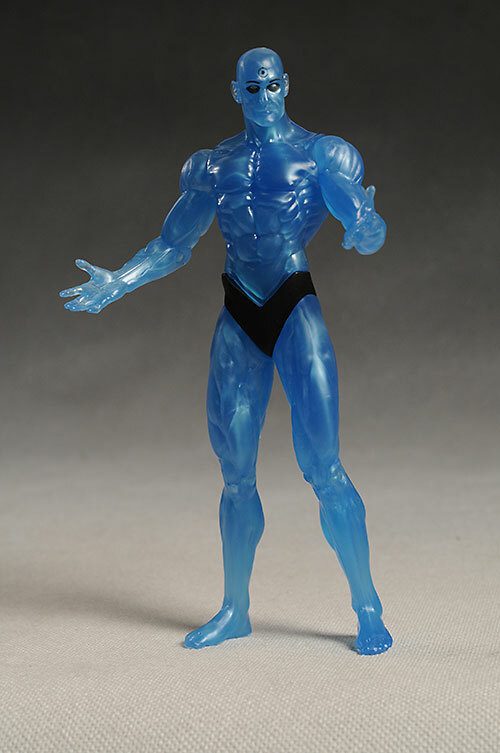 Not because there's anything more complicated here - he's an all blue guy with a black Speedo, eyebrows, eyes and funky atomic forehead dot - but because of the use of the translucent plastic. I've always loved clear figures. In fact, at one point I had a section of my collection dedicated to them, until there got to be too many of them out there to find. While I do like the slightly pearlescent look of the first figure, this clear blue plastic really captures the essence of the character, particularly when he was floating around and laying waste. It will be possible to light him just right on the shelf, and get a cool pseudo aura around him. There's also some potential here to attach some very small LED's to his back, arms and legs, and get a pretty cool effect. One problem with clear figures like this is that the underlying joints - the pins, posts and discs - can be too obvious and distracting. I was worried about that myself, but in hand it's not an issue at all. I don't know if it's something about the slightly dark blue color, or something about how the light is being reflected within, but the joint mechanics are surprisingly well hidden. 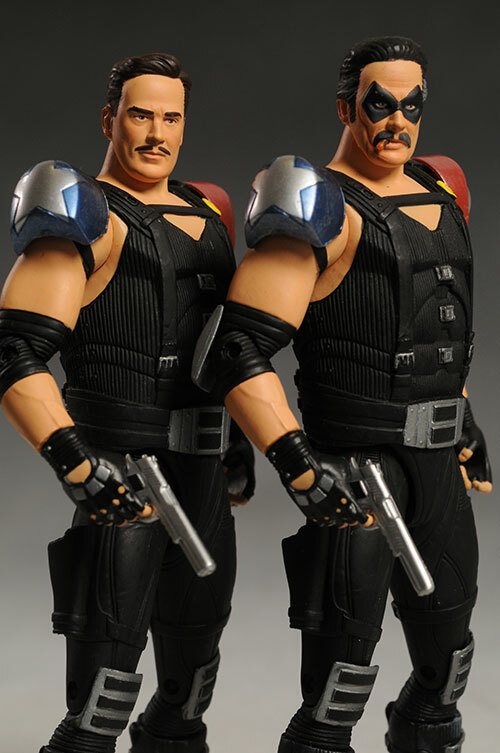 The articulation on these two figures is identical to the regular figures. Both have ball jointed necks that work quite well, and both have ball jointed shoulders. 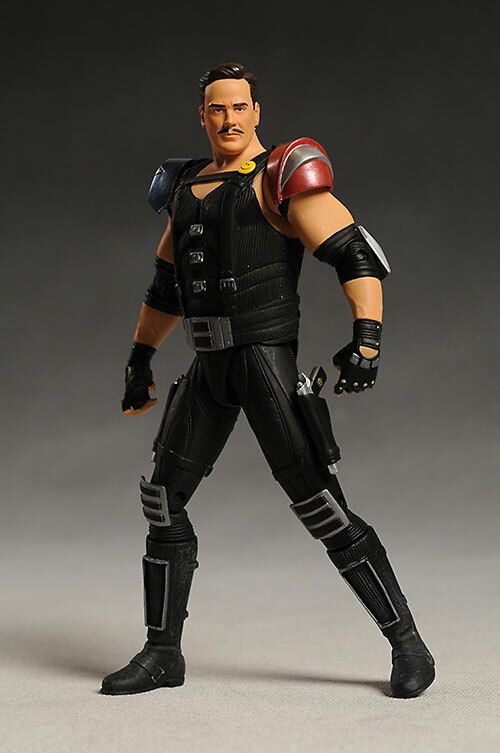 The shoulder pads on the Comedian move up and down to avoid restricting the arm, but the little straps that hold them in place look like they could break over time. They both have single pin elbows and knees as well as V style cut hips. The Comedian has cut wrists, but unfortunately, Dr. Manhattan does not. As you can see, that's not a ton of articulation. They can each take one or two key poses, and that's about it. The variant Manhattan and Comedian get the same score here as their non-variant counterparts I reviewed a couple weeks ago. Yep, they come with the exalt same extras. The Comedian has the girder/platform base, along with the pegs and connectors for it. He doesn't need it to stand, however, so it's only useful if you're looking for consistency across the series in your display. Or you want one version to stand taller than the other in a back row sort of set up. He also has his guns, and just like the regular version, they look terrific, fit in his hands and holsters equally well, and are the perfect addition. However, at a $18 or more price point, that's pretty light in the accessories department. Manhattan has the standard stand as well, but he also comes with a small clear stand that looks like turbulent air, as well as an extra set of legs to use with this stand. You can put him in his 'hovering' pose with this set up, and that works extremely well. In fact, I'd bet 90% of the people that display this figure will do so with the extra legs and display stand. The movie's not a kid's movie, and these aren't really kid's toys. They aren't all that great of action figures either, lacking some critical articulation. 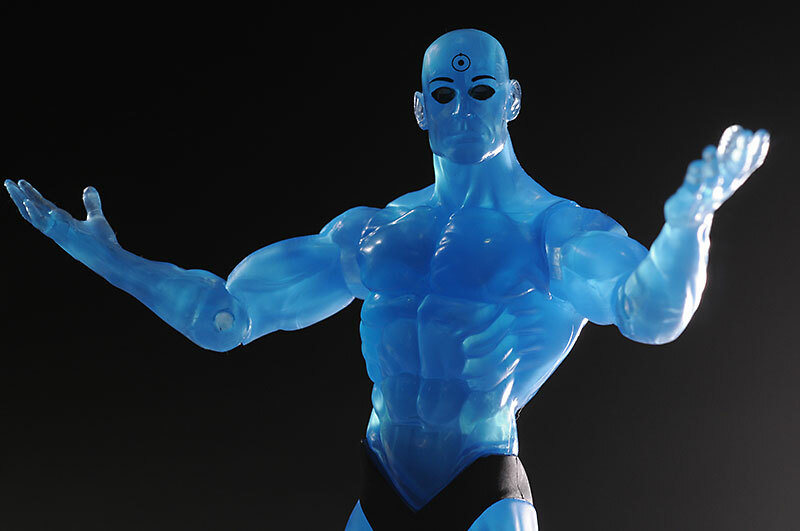 The translucent Dr. Manhattan does look pretty cool, and an enterprising kid might use him as a Superman stand in, but generally speaking there are much better action figures out there when it comes to play value. The regular figures tended to sell in the 16 - $18 range, and these are a couple bucks more. Yea, they're 'exclusive', but they aren't all THAT exclusive or difficult to find. I do have to admit though that the translucent doctor is pretty damn cool, and with the extra base and legs, tends to be the better value. Not a thing. I didn't have any joint issues, and I suspect the paint ops are fairly consistent across the series. If you're only going to pick up one Comedian, than the standard version is the one to get. They're identical from the neck down, and this 'young' version doesn't look anything like the film character. Yea, I know that the old version is a bit weak in that regard too, but at least the mask and scarring hides the issue a bit. Ah, but when it comes to Manhattan, if you can only have one, get the variant. The clear blue plastic looks great, and DC Direct really executed well on the concept. - has the variants for $19 each. - Entertainment Earth has the Manhattan variant for $20.79. I've covered series 1 in two reviews, one of Ozymandias and modern Silk Spectre, and the other of Rorscach and modern Nite Owl. Last week, I checked out the regular releases of these two figures as part of my series 2 review. 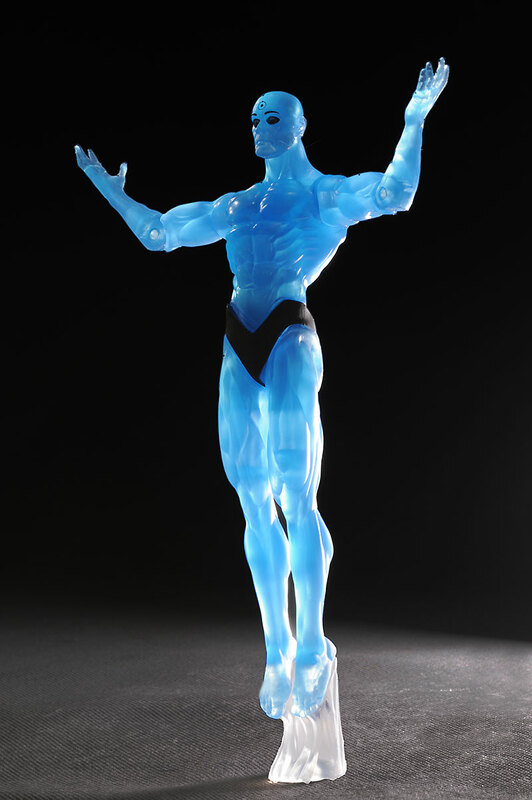 I also checked out one of the 13" deluxe figures, Dr. Manhattan.